The Madison County Museum archives document the stories of Orphan Train Riders. Many of them came to our area as well as throughout the United States. 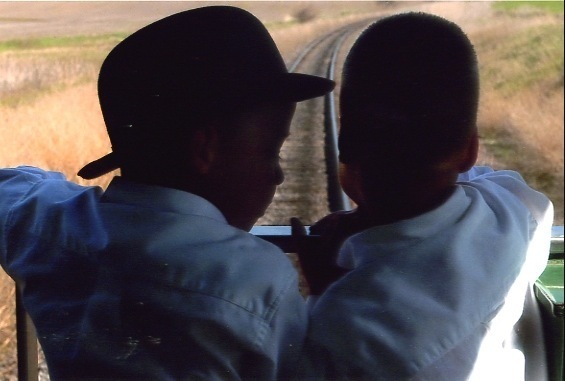 In 2003 the Nebraska Orphan Train Riders' Reunion was held in Madison with eight (8) actual riders and many of their spouses and descendants attending as over 300 people experienced a history lesson which needed to be told. As one looks at the faces of these small children as they rode, one wonders what had to be going through those young minds?! Were they wondering where the rails were taking them?Their stories are fascinating, sometimes sad, sometimes heartwarming; but always a part of history. Come learn about this part of America's history at the Madison County Museum in Madison. When firemen fought fires more than a century ago, they pulled the truck pumper to the fire and hand-pumped the water that was carried to the wagon in a bucket brigade. The buckets were made of leather. The equipment included a hand pump operated by long, long bars on the sides of the wagon. Three men on each side of the wagon pushed the bars up and down to pump the water out of the rubber hose. The pump could throw the water up to 40 feet according to former fireman, Bob Cummings. 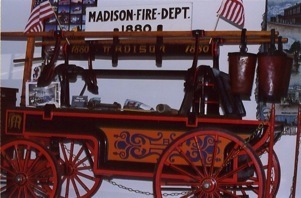 This pumper is on display at the Madison County Historical Society in Madison, NE, along with other memorabilia from the Madison Volunteer Fire Department. The NNMRA currently has two modular railroad layouts: HO scale and N scale. The first is an HO scale module. The layout materials and trains are approximately 1/87 of actual size. The modular layout is a combination of 2’ x 6’ sections which are connected to form a continuous track line. 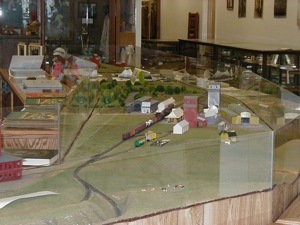 Each section contains an individual scene created by a club member. There are also three sections placed together that make up one scene created by all members. The sections can be disassembled to transport to various shows and then reassembled for smooth operation. 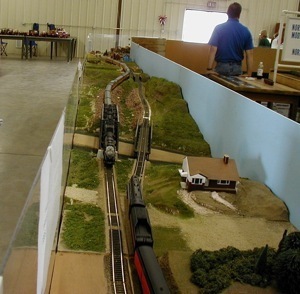 On average, the HO layout is 28 to 34 feet long by 18 feet wide at shows. This equates just over one and a half prototype miles for each main line. The N-scale module is 1/160 of actual size. The normal N-scale layout consists of 3 balloon modules and one ‘T’ module which have been built and scened by club members. In addition two club members have straight modules which they have personally built and scened. These are also used during N-scale shows. The module covers an area approximately 12 feet wide and 16 feet long. The N-scale layout also has two mainlines, each approximately 56 feet long which represents just over one and a half prototype miles. 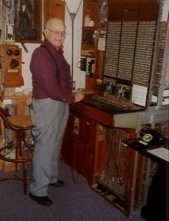 Gordon Moritz of Norfolk developed this display and welcomes your visit to the Telephone Pioneers Communications Display at the Madison County Museum in Madison, NE. This interactive display explains communication from the telegraph to today's fiber optic technology. The Telephone Pioneers have received national recognition with this permanent exhibit. 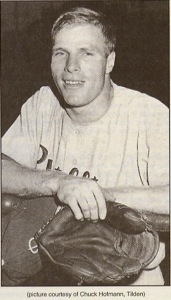 Tilden, NE, has always been proud of Richie Ashburn and the baseball memories he furnished them from his youth in Tilden, his career with the Phillies and election the the Baseball Hall of Fame in 1995. A special Richie Ashburn display is at the Madison Museum organized by Chuck Hofmann of Tilden and the Ashburn family of Madison County. © 2011 Knapp Studios. All rights reserved.